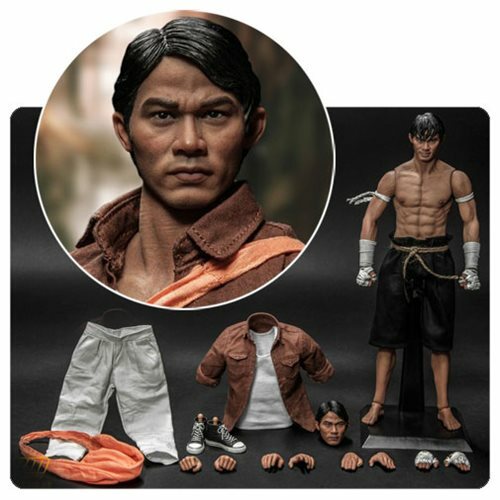 Highly detailed collectible 1:6 scale action figure of Tony Jaa's Ting from Ong-Bak: The Thai Warrior! Features an extra in-action facial expression head-sculpt, three pairs of interchangeable palms, and one pair of interchangeable wrapped palms. Includes movie outfit - white sleeveless shirt, brown shirt, gray pants, pair of sneakers, orange sack, plus black shorts with hemp rope belt! Ong-Bak: The Thai Warrior is a 2003 worldwide hit Thai martial arts action film starring the most well-rounded martial art superstar, Tony Jaa. Jaa perfectly combined martial art, muay thai, and stunts without mechanical assistance or computer-generated effects, and it shocked the whole world with his revolutionary breakthrough. Storm Collectibles is honored to be granted the official license to produce the 1:6th scale Ong-Bak: The Thai Warrior Ting Action Figure! The first time the Thai action movie star ever been made into a collectible figure, this amazing 1:6 scale articulated action figure has been produced with a highly detailed head and body sculpt with highly detailed muscle body and outfits, mirroring the likeness from the movie in every way possible. Ages 14 and up.